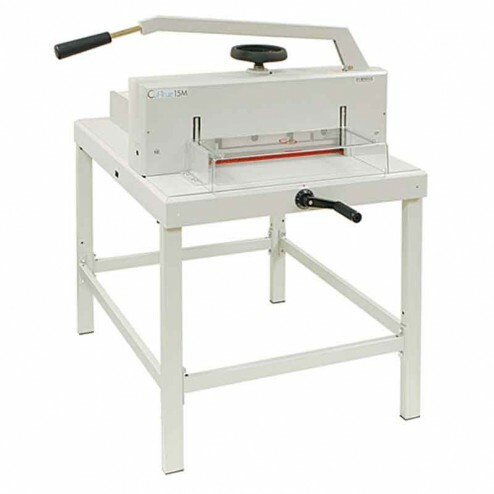 The Formax Cut-True 16M Manual 18.7" Stack Paper Cutter saves time and money. The Formax Cut-True 16M Manual Paper Cutter is perfect for use in print shops and in-plant finishing. Excelling in transforming brochures, invitations, and more with crisp, accurate cuts, the Cut-True 16M boasts a number of standard features including a hardened steel blade that easily slices through paper stacked over 3 inches high. The guillotine blade and LED laser ensure precision cuts. The front and rear transport covers, blade lock, and wooden paper push all ensure user safety. The 16M also comes with a rugged, all-metal stand.